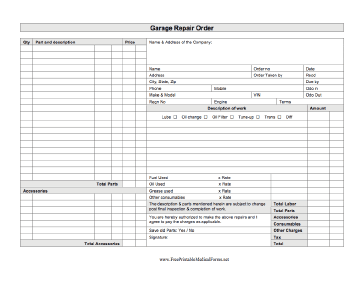 An auto mechanic can use this printable business form to write up a repair order for a customer's vehicle. Includes space to describe both parts and labor involved in any repair or service. The description & parts mentioned herein are subject to change post final inspection & completion of work. You are hereby authorized to make the above repairs and I agree to pay the charges as applicable.